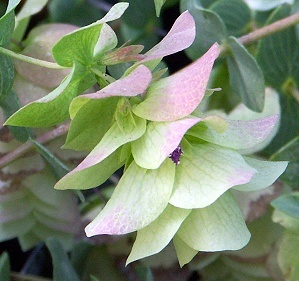 One of the unique features of Kent Beauty Oregano are the prominent veins found in the heart-shaped blue green leaves. Of course, the flowers are spectacular too. Or should we say the bracts, for it is the pink and chartreuse flower bracts that make this an outstanding ornamental oregano. The bracts in our photos would show a little darker pink if they had been exposed to full sun. These were grown under shade trees. If you look closely at the picture on the right, you can see the remains of what was once a pale pink flower. as it dried it became a tiny purple flower. This Kent Beauty Oregano was planted from one of our three inch pots and potted into a gallon size container in August. By the following June, it was over flowing. 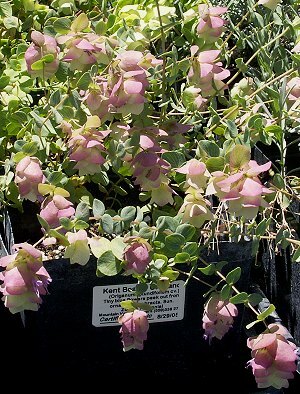 Kent Beauty is a very nice hanging basket plant, or a top-of-the-wall plant, but because the blooms hang the effect is somewhat lost when planted at ground level. When it is finished blooming. it will need to be cut almost to the ground and repotted in a larger container or planted into the garden. It does not take foot traffic well, so plant where it is protected. The bracts can be cut and dried for crafts. Cut the stems before any browning occurs on the bracts. Hang upside down to dry. Or use them fresh and add them to other herbs to make a fresh herbal wreath. 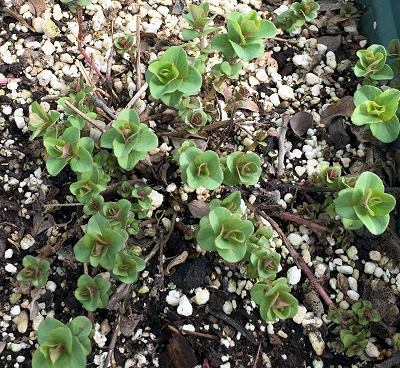 Kent Beauty Oregano dies back to the ground in the winter and remerges each spring. The crown gets bigger each spring as the stems reach out and root in different spots in the soil. These stems will elongate until the flower wands take over. A pretty plant even out of flower! This plant is sometimes available in plug trays. These trays hold 128 of all the same plant. They are a great low cost way to fill a lot of space. Each cell is 3/4 of inch by an inch. Check here to see if Kent Beauty Plug Trays are available.